Annan lifted the points in this Ladbrokes SPFL 2 encounter at Galabank on Saturday against a very competent Montrose team who were always chasing the game after Annan scored twice without reply in the first half. It was once again their recent signing Smart Osadolor whose two goals proved to be the decisive factor between the 2 evenly matched teams. The striker who has already hit the net scoring 4 goals in the opening fixtures continued his early season scoring form with a further 2 goals. Osadolor opened the scoring with a superb worked goal in the 12th minute when he was part of a superb four man passing move down the left hand side culminating with Osadolor striking a low crisp shot into the corner of the net after some fine football involving Josh Todd and Rabine Omar down the right which cut open the Montrose defence. 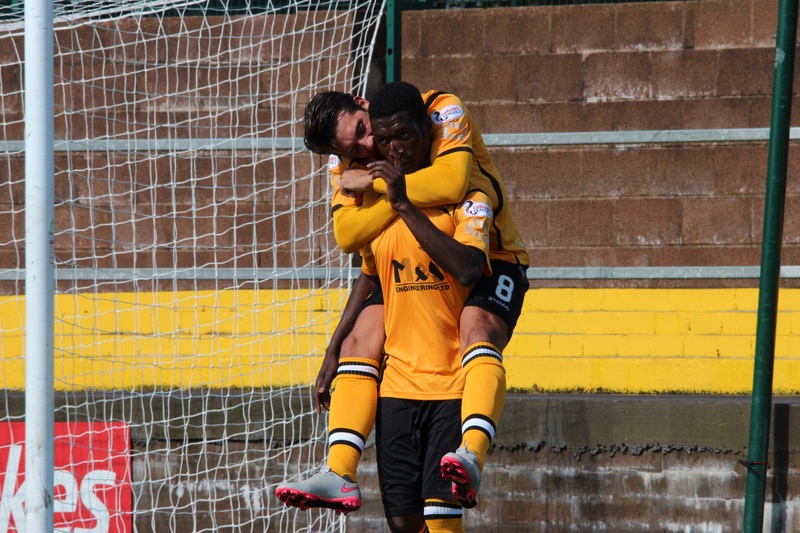 The Annan striker was also at the heart of Annan’s second goal in the 21st minute. Annan broke swiftly from defence exposing Montrose and all of a sudden Flynn and Osadolor were against one defender and 4 passes later Osadolor squared the ball for Flynn to stoke the ball into the net from 6 yards. It was Fynn’s third goal of the season and was testament to the player ability to get into the box and to get on the end of the final ball from midfield which proved decisive. It was the perfect start for Annan against a Montrose side who appeared to struggle to contain the smooth moving Annan team who looked very much up for the task and had Peter Watson’s 33rd minute effort gone in instead if striking the cross bar the game could have been over at half time. It was however a different storey in the second half with the game evenly contested. Annan missed a golden opportunity to increase their 2 goal advantage in the 48th minute when Weatherson’s fee kick was parried by Jordan Miller and Martin McNiff’s follow up from 3 yards was somehow saved by keeper when it looked easier for McNiff to score. After this let off Montrose started to get their game together and in the 51st minute they were back in the game with a superb taken goal by Graham Webster who connected brilliantly with Scott Johnston’s cross swung in from the left to the back post with Webster finishing with a volley into the roof of the net. Annan rallied from the set back with Weatherson heading over the bar in the 56th minute closely followed by an Osadolor shot from 15 yards which flashed past the upright. Montrose started to dictate the play without really testing Hart in the Annan goal, Graham Webster came close with a good effort in the 70th minute with his shot just missing the target. Montrose then suffered a further set back when Keeper Jordan Miller sustained a shoulder injury when under pressure from an Annan corner. A minute later Osadolor had a goal chalked-off side as Annan’s pace one again exposed the Montrose defence. Annan looked to have secured the points in the 86th minute when Weatherson’s header from a Rabine Omar picked out Osadolor inside the 6 yard box with a volley into the roof of the net via the cross bar. Despite this set back Montrose pulled a goal back deep into injury time from the penalty spot after Ross McCord was fouled and McCord dispatched the goal into the corner of the net to bring to an end another close encouter. It is early doors but it is already more than evident that after 4 games, all of the teams have been defeated with each team more than capable of beating the opposition. The league positions at the end of the year will be dependant more than ever on home form and obtaining victories as opposed to draws and you can forsee the situation developing that battle to stay clear of the bottom spot could go down to the last day of the season. ANNAN ATHLETIC: Jordan Hart, Steven Black, Steven Swinglehurst, Martin McNiff, Peter Watson, Steven Sloan, Rabin Omar, Mathew Flynn, Peter Weatherson, Josh Todd, Smart Osadolor. SUBS NOT USED:-Blair Currie, Ryan McStay, Jamie Watson, Scott Norman, Liam Park. MONTROSE : Jordan Miller ( Ross Salmon 79 min), Ryan Ferguson, Andrew Steeves, Greg Pascaszio (Jordan Rioch 76 min) ,Matthew Allen, Ross McCord, Scott Johnston, Paul Watson (Terry Masson 24 min), Graham Webster, Gary Ferguson, Ross Campbell. Subs Not Used Ryan Kenneth, Declan Milne, Dale Reid, Kyle McCleod.